I witnessed a murder yesterday. One of the allotment cats, a rangy black-and-white thing that’s about three times the size of Gertie, was lurking around the compost bin. She/he (I think he) was clearly up to no good, a fact given away by the resoluteness of his stare – that and the fact that he totally ignored me wittering away to him when normally this results in a speedy sprinted getaway. Said feline ambled up the side of the pallets, hopped onto the rotting corn silks, and two seconds later emerged with a brown rodent chomped between his jaws. The whole things was languid and effortless, and the mouse (rat?) population lost another one of its own. For wildlife, life is lived wild; the end is always nigh. Autumn is about death of course, the letting go of what is no longer needed in order to regroup for the following season. 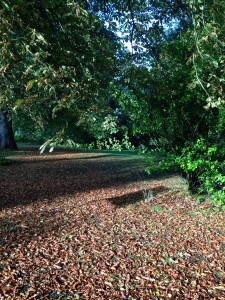 The air now smells of sweet decay, the grass is carpeted in soggy auburn leaves. Amongst the carpet lie conkers and their discarded cases. No matter how old you are, seeing the first conker of the season, freshly sprung from its velveteen womb, is an excitement. But there is life amidst the decay. The squash are coming along and the borlottis are now finally setting their beans. I harvested a load more cima di rapa this morning, the tiny green heads already turning to flower. It needs to be harvested before it bolts or the whole lot becomes tough and inedible. 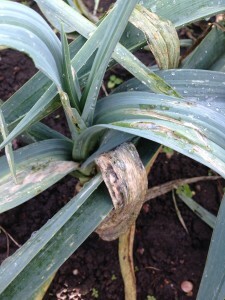 I mentioned that the leeks aren’t doing so well. They’ve been got by a fungal bug, causing them to droop and brown off. I think the lot will need to be pulled and we’ll have to live off leek and potato soup for a month. But the hyssop is in flower, possibly the most beautiful thing on the allotment currently. 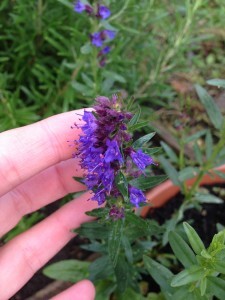 For a tiny plant, the herb produces the most vibrant acid purple flower. These were planted in mid-June. And those cosmos: the cosmos seem to be – if you’ll excuse me – the talk of the allotment. Whenever I see any of our neighbours I get SERIOUSLY complimented on the cosmos. I will happily take the praise but really, I have done nothing – I didn’t even plant them, my mother did. They’ve been a glorious mass of pure white for about 6 weeks now, probably more, and are only just beginning to fade. I spent an hour this morning dead-heading, the early sun warming my back. At all times, but particularly at this time, the greatest wisdom must be to notice and enjoy the moment whilst you can. This entry was posted in Allotment, Autumn and tagged Borlotti, cima di rapa, Cosmos, leeks. Bookmark the permalink.